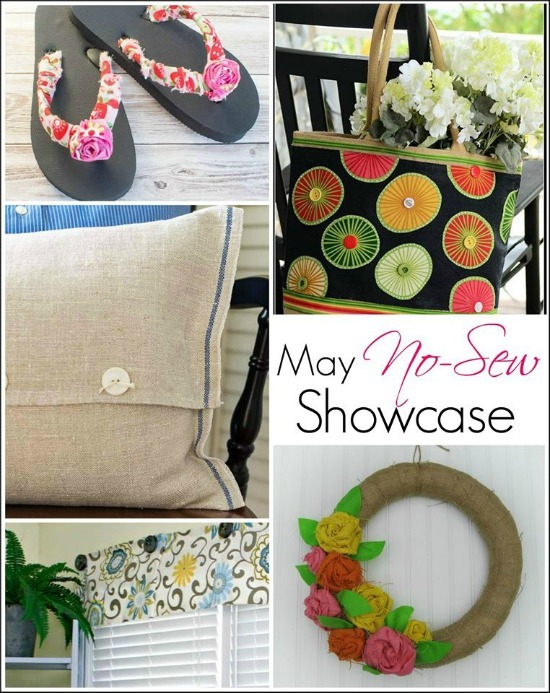 Welcome to the May edition of our No Sew Showcase! Our little group is still hanging in there and this month we came up with some great projects. 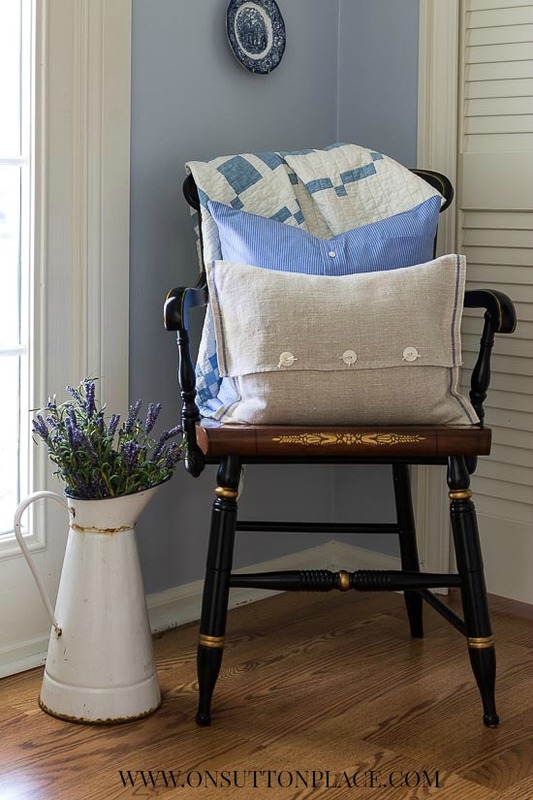 Today I’m sharing a no sew pillow cover made from a vintage tea towel. I had some vintage tea towels listed in my online shop a few weeks ago and they sold out the first day. I have more that are washed, pressed and ready to be photographed. I hope to have them all listed in a few days. So if you want to make one of these pillow covers, hang tight and I might have the perfect towel. A.) Lay your tea towel on a flat surface. Fold the bottom of the towel up 11 inches. Measure both sides so it’s straight and even. Transfer to an ironing board. Press the bottom fold. Cut 2 pieces of fusible tape, 11 inches long. Lay the bottom section over a bit, place the tape on the both edges, cover the tape with the flap and press according to the directions on your package of fusible tape. Let cool. B.) You have just made a “pocket” from your tea towel. Insert your pillow form. C.) Fold the top of the tea towel over the pillow insert, forming a flap. Embellish the flap any way you like. I added vintage buttons tied on with embroidery floss. Close the flap with a few dots of hot glue or a piece of fusible tape. If you have time to visit the links just under this collage I think you will find some great stuff. I couldn’t let this day go by without wishing the mothers out there a Happy Mother’s Day…I hope your day has been lovely. We all know that no one’s family is perfect. Every family has its special gifts and shortcomings. My family is no different but every once in a while they come through and make me so thankful to have them in my life. My kids came home for the weekend, we had a nice dinner out last night and lunch with my mom today. They made the effort to make it special for me and I must admit I was quite touched. I’ve had my share of not-so-great Mother’s Days but this was not one of them. For that I am grateful. 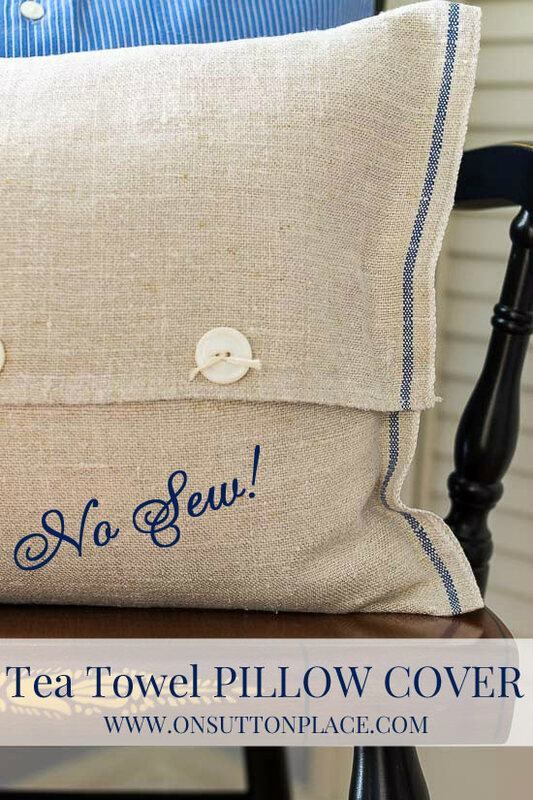 Here are some more No Sew Projects and here are some Pillow Tutorials. 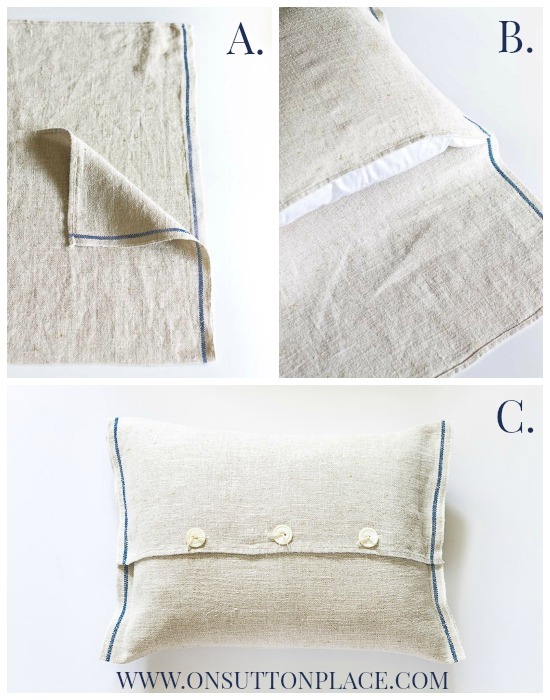 Here is the Repurposed Shirt Pillow Cover tutorial for the blue pillow that’s pictured above. Just in case you are inspired. It’s a great pillow, Ann! I think even I could make it :) Glad you had a wonderful Mother’s Day! It’s true that not every one of them is perfect, but we do cherish the ones that are. I’m so happy you had a great Mother’s Day! They can’t all be perfect but I think we’re always grateful that we have them in our lives to begin with. I am definitely going to try to make this pillow. And today I saw in Redbook magazine how to make a table runner out of tea towels. May try that, too! I love it Ann! The buttons with the embroidery floss are the perfect addition too! Pinning! This is so simple, but so gorgeous. And it looks so easy to make. I’m glad you had a nice Mother’s Day this year. We enjoyed a low-key day since everyone is recovering from being sick, and since I didn’t get to see my mom and treat her, I’ve promised her a lunch out some day soon. Ann, I just love this guick pillow. Hope I get in on the next batch of towels. A must try!!!!! Love the pillow…..great idea! I have a pillow that size that I’m dying to recover. You’ve given me the answer to my predicament. Thanks as usual for more great ideas. Sounds like you had a really lovely mother’s day. I had a wonderful afternoon and evening with my daughter, son-in-law and grandsons….gifts and dinner out. My youngest grandson did some artwork in 2nd grade that was reproduced into a pin for me, a coffee mug for his other grandmother, and a travel mug for his mom. So cute. I have to wear it today and show it off at my ladies luncheon. Darling! Crisp and perfect like always. I look forward to making this and then the valance is next! So glad to hear your Mother’s Day was grand :) I spotted your gifts on FB, you are a lucky girl! Love this! I’ll be watching for the towels in your shop. I like your no sew pillow. Honest what you said about Mother’s Day. I’m happy that you had a wonderful day and was able to see your mom. My sister and brother took our mom out for dinner. I’m grateful they live close enough to be able to do that. I enjoy you blog..